DHARAMSHALA, Feb. 11: A Tibetan woman who recently won the election for President of the University of Toronto Scarborough Campus Student Union (SCSU) is faced with a group of Chinese students appealing the results in a petition. Chemi Lhamo, a Neuroscience and Psychology student in her fourth year of study, led the Shine Bright UTSC slate as its presidential candidate having served as the Vice President Equity at SCSU for years. Her win saw an inundation of congratulatory messages from Tibetan netizens across the world. However, a group of Chinese students who protested her candidacy are now appealing the results. The petition casts aspersions over her qualification for the position as she was firstly “selling miserable stories to students” and secondly for her involvement in the political arena as a part of Free Tibet group, a reference to her Instagram account description. After her win, Lhamo said, "I’m honoured to share that I will be serving as the President of the University of Toronto Scarborough Student’s Union starting May 1st once ratified. Driven by my values of wisdom and compassion, I’m looking forward to this new step." On the other hand, Tibetan supporters like Tenzin Gyaltsen took to Facebook to say “It’s a proud moment in our history for Tibetan taking leadership roles in renowned Universities” and dubbed the petition as part of the propaganda of the Chinese hardliners with really weak points to claim their view. 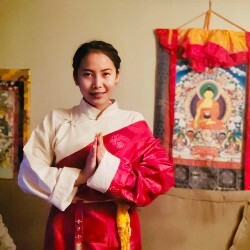 Following suit, Pema Tibet, a former intern at Students for a Free Tibet and a student of Financial policy at American University congratulated Lhamo on winning the election fairly after several years of service to her university and months of campaigning with her group #shinebrightUTSC. Pema, in her post, lauded Lhamo for maturely handling all the personal attacks she received on social media from a group of Chinese students.